Pest monitoring Sweep nets can be used to sample for lygus bugs. In the Pacific Northwest, a suggested treatment threshold is 0.5 adult or 0.5 fourth or fifth instar per sweep. In California, for dry beans, treatment thresholds vary depending on the variety and the stage of the crop, from 0.5 to 2 lygus bugs per sweep. 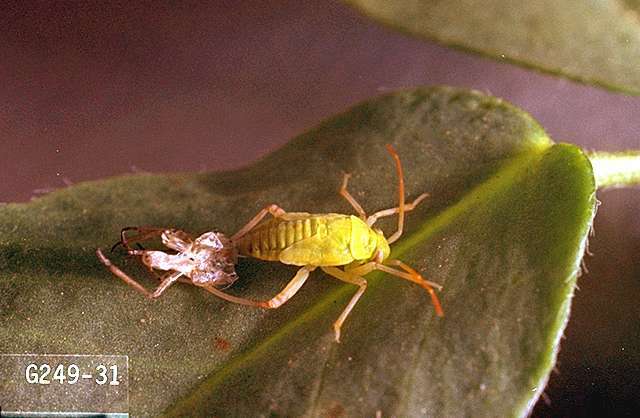 Generalist predators, such as lacewings and damsel bugs, may prey on lygus bug nymphs. Parasitic wasps may also prey on lygus such as Peristenus spp. Conserve populations of these biological control agents by minimizing applications of broad-spectrum insecticides. 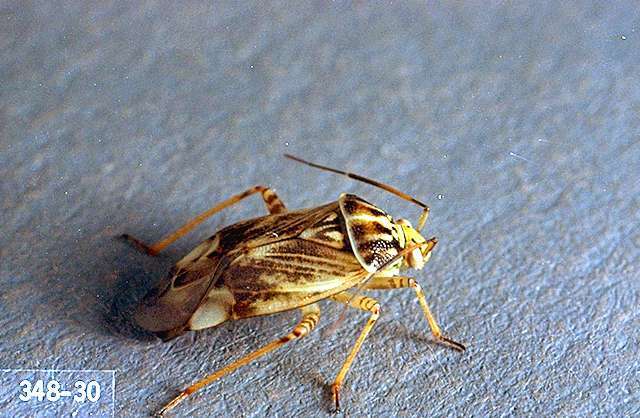 Lygus bugs are likely to move when other food sources become unsuitable. Common weeds that are good hosts of lygus bugs include pigweed and wild radish. Mowed alfalfa fields nearby are commonly a source of large numbers of lygus bug adults. There are a number of practices to reduce or control the movement of adults from alfalfa into nearby bean fields. 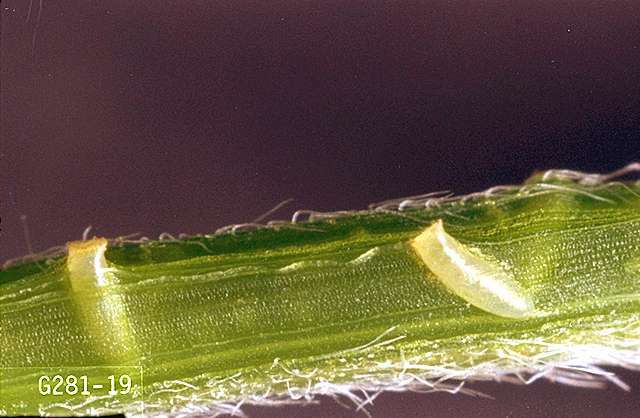 These techniques leave uncut, tall alfalfa (attractive to lygus bug adults) within or near the cut area. acephate (numerous products) at 0.5 to 1 lb ai/a. PHI 14 days, 0 days for lima beans harvested in succulent form. REI 24 hr. Do not feed treated vines. Do not exceed 2 lb ai/a per year. beta-cyfluthrin (Baythroid XL) at 0.019 to 0.025 lb ai/a. PHI 7 days. REI 12 hr. Do not exceed 0.05 lb ai/a per season. Do not feed treated vines or hay to livestock. carbaryl (Sevin) at 1 to 1.5 lb ai/a for tarnished plant bug. PHI 3 days for harvest of succulents, 21 days for harvest of dried, 14 days for forage, and 21 days for hay. Retreatment interval 7 days. REI 12 hr. Do not exceed 6 lb ai/a per crop. Toxic in aquatic habitats. Do not apply carbaryl dust to blooming weeds because of severe hazard to pollinating bees. Latex-based formulations, such as Sevin XLR Plus, are less hazardous to bees. chlorantraniliprole/lambda-cyhalothrin (Voliam Xpress) at 0.059 to 0.088 lb ai/a. PHI 7 days for edible podded and succulent shelled legumes, 21 days for dried shelled legumes. REI 24 hr. Retreatment interval 5 days. Do not exceed 0.12 lb ai of lambda-cyhalothrin or 0.2 lb ai of chlorantraniliprole per acre per growing season. Do not graze livestock or harvest vines for forage or hay. lambda-cyhalothrin (Warrior II) at 0.02 to 0.03 lb ai/a. PHI 7 days for green beans, 21 days for dry beans. REI 24 hr. Do not feed or graze livestock. Do not exceed 0.12 lb ai/a per year. Do not apply within 25 ft of an aquatic habitat, 150 ft if applied by air. malathion (numerous products) at 1.5 lb ai/a. PHI 1 day. REI 12 hr. Do not graze or feed foliage to livestock. methomyl (Lannate) at 0.45 to 0.9 lb ai/a. PHI 1 to 3 days for succulent beans, 14 days for dry beans, 3 days for feeding vines, 7 days for hay. REI 48 hr. Do not exceed 4.5 lb ai/a per year. naled (Dibrom) at 0.94 lb ai/a. PHI 1 day. REI 48 hr. Do not apply within 25 ft of an aquatic habitat, 150 ft if applied by air. sulfloxyflor (Transform WG) at 0.75 to 1.0 oz/a. Do not exceed 8.5 oz/a. PHI 7 days. REI 24 hr. If blooming vegetation is present 12 out from the downwind edge of the field, a 12 foot in-field down wind buffer must be observed.